Context: Estimation of the age is a procedure adopted by anthropologists, archeologists and forensic scientists. Different methods have been undertaken. However none of them meet the standards as Demirjian's method since 1973. Various researchers have applied this method, in both original and modified form (Chaillet and Demirjian in 2004) in different ethnic groups and the results obtained were not satisfactory. Aims: To determine the applicability and accuracy of modified Demirjian's method of dental age estimation (AE) in 8-18 year old Tibetan young adults to evaluate the interrelationship between dental and chronological age and the reliability between intra- and inter observer relationship. Settings and Design: Clinical setting and computerized design. Subjects and Methods: A total of 300 Tibetan young adults with an age range from 8 to 18 years were recruited in the study. 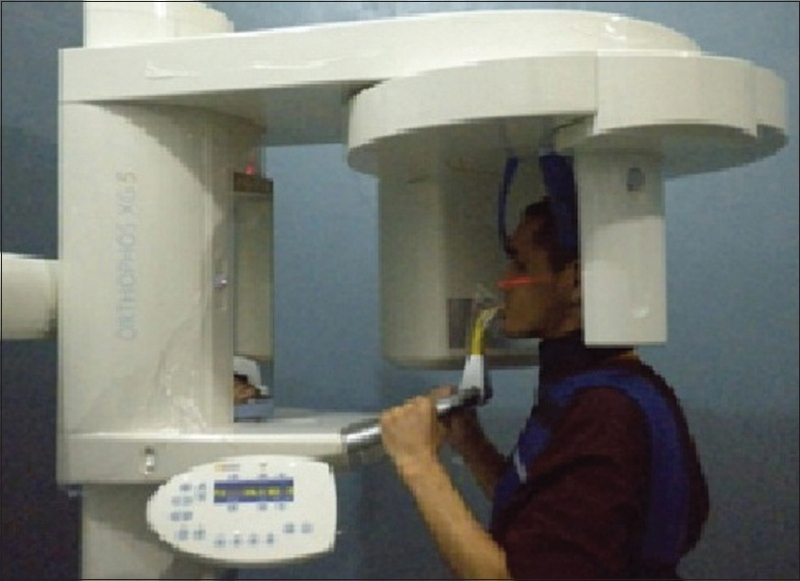 Digital panoramic radiographs (DPRs) were evaluated as per the modified Demirjian's method (2004). Statistical Analysis Used: Pearson correlation, paired t-test, linear regression analysis. Results: Inter -and intraobserver reliability revealed a strong agreement. A positive and strong association was found between chronological age and estimated dental age (r = 0.839) with P < 0.01. Modified Demirjian method (2004) overestimated the age by 0.04 years (2.04 months)in Tibetan young adults. Conclusions: Results suggest that, the modified Demirjian method of AE is not suitable for Tibetan young adults. Further studies: With larger sample size and comparision with different methods of AE in a given population would be an interesting area for future research. Age estimation (AE) is of broader importance, not only in connection with crimes and accidents, but also for identification purposes of deceased victims. AE in dead or alive person has tremendous importance, especially in adult refugees. Several methods were described in the literature that are designed for dental AE in young adults. Among those, the radiographic techniques need observation of the mineralization of crowns and roots of deciduous and permanent teeth. 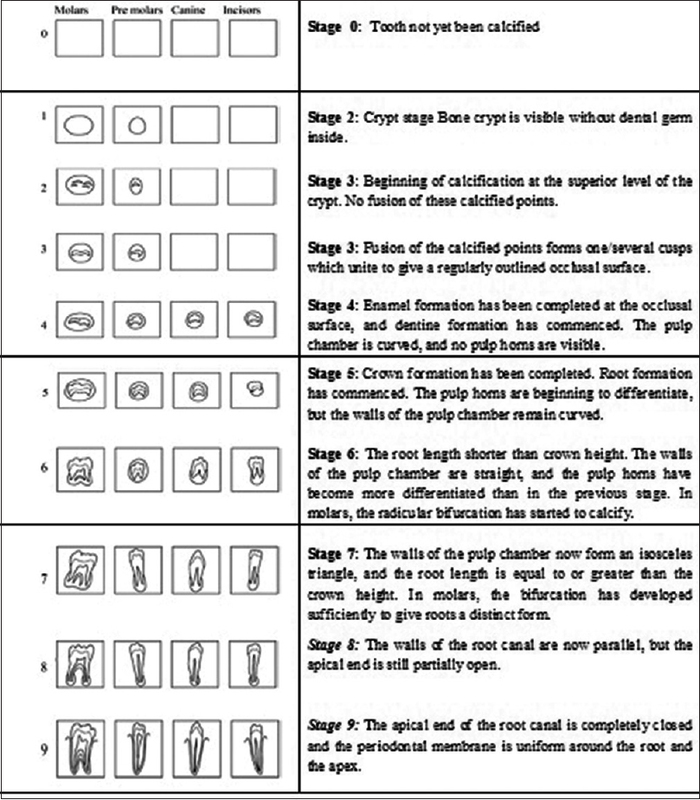 Various radiographic stages have been suggested by various authors and range from Hunt and Gassler's three stages to Nolla's forty stages. Modified Demirjian's method (2004) is most accurate and reliable; furthermore it also showed better inter- and intraobserver agreement in previous studies. , As yet no studies have tested this modified Demirjian's method on Tibetan population, this study purposes to evaluate the applicability of modified Demirjian's method (2004) for AE on selected Tibetan young adults with the ethnicity proof, from the first Tibetan settlement, that started in 1960 with the help of Indian government, to be found at Bylukuppe village : in Periyapatna taluk of Karnataka state. Located nearby Coorg Institute of Dental Sciences, Virajpet. 300 Tibetan young healthy individuals from Bylukuppe village, near Kushalnagar, Coorg district, were recruited for the present cross-sectional study, including healthy individuals of both the genders with an age range of 8 to 18 years were randomly selected. The study was conducted in the Department of Oral Medicine and Radiology. Permission to carry out this study was obtained from the Institutional Ethics Committee. We enrolled the study subjects with the ethnicity proof. All the study subjects were informed about the objectives of the study and explained about the benefits and risks. Once they voluntarily signed an written informed consent, clinical examination was conducted and individuals with the history of congenital/genetical abnormalities; endocrine, nutritional and degenerative disorders; developmental and acquired disorders affecting the teeth; orthodontic treatment or extraction; trauma to the head and neck region; previous prolonged illness; bilaterally missing teeth in the mandibular region; and poor quality images (unclear orthopantomographs) were excluded from the study. DPRs were obtained by panoramic X-ray unit (ORTHOPHOS XG 5DS-Sirona, Germany), with exposure parameters of 66 kVp, 8mA and 14.1 s. In the standard Panoramic View (P1) mode, following the radiation protocol (ALARA principle) [Figure 1]. All the DPRs were coded to minimize bias and were viewed in personal computer with specially designed Windows Sidexis software for rating. Eight permanent mandibular teeth on left side on each DPR, comprising incisors (CI and LI), canines (C), premolars (PM1 and PM2) and molars (M1, M2 and M3) were rated [Figure 2]. Based on 10-stage scale from 0 to 9 for each tooth given by Chaillet and Demirjian (2004) and Demirjian and Levesque (1980) [Figure 3]. , In cases with unilateral hypodontia, first molar extraction or any radiographic errors, same tooth but from the opposite side was taken into consideration. The rating was carried out by two examiners (oral medicine and radiologists), date of birth of each study subject was hidden from both the examiners and were blinded from each other. Each rated tooth with stage was converted into score using conversion table specified by Chaillet and Demirjian for girls and boys as appropriate. Scores of eight left mandibular teeth were summed to get the dental maturity score. Chronological age was recorded as the number of years between the date of birth according to the authenticated birth registration certificate and the date at which the radiographs were exposed for individual. Statistical analysis was performed using the Statistical Package for Social Sciences (SPSS ) software 16.00 package for windows. Inter -and intra observer agreement was determined by paired Student's t-test and Pearson correlation between chronological age and dental age was performed on Tibetans (girls and boys). Linear regression analysis was performed for obtaining the new maturity scores for dental age in Tibetan young adults. 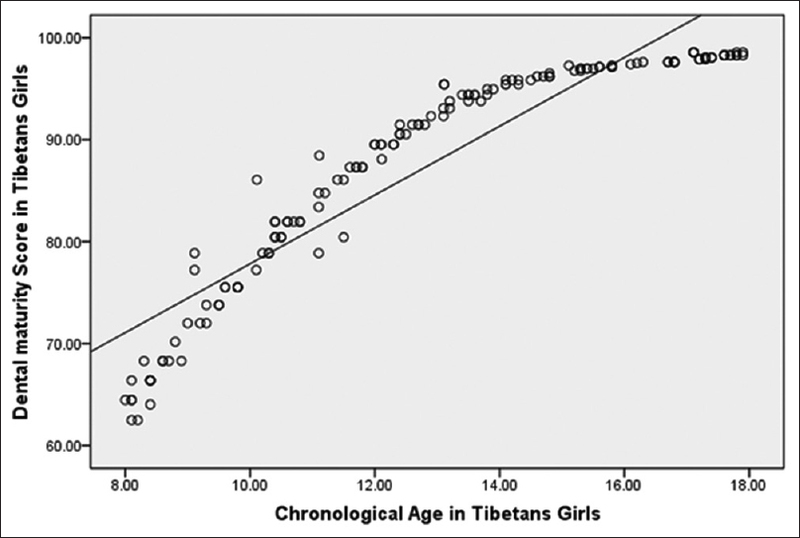 Out of total study sample (300), 50% (n = 150) were boys and 50% (n = 150) were girls of Tibetan young adults (300), with an age range from 8 to 18 years. Inter -and intra observer's error was calculated and there were no significant differences found. Intra observer's paired Student's t-test with α set at 0.01: t = 0.32, P = 1 (degrees of freedom (dof) = 29, α = 0.05, 1−β = 92%). Inter observer consistency was rated at 99%, inter observer paired Student's t-test: t = 0.16, P = 1.41 (dof = 29, α = 0.05), with statistical power of 85%, (1 − error β expressed in percentage) [Table 1]. 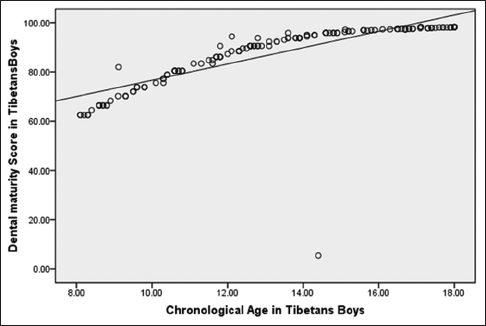 A positive and strong association was found between chronological (real) and estimated dental age (girls: r = 0.928 and boys: r = 0.77) with P = 0.01 with Pearson's test in Tibetan young adults [Figure 4] and [Figure 5]. To compare the mean chronological and dental age as obtained from modified Demirjian's method resulted in consistent overestimation of 0.04 years (2.04 months). Dental age for the Tibetan young adults, amounting to a median of significant positive correlation (P > 0.01) between dental maturity and chronological [real] age with Pearson correlation is of 0.839 in Tibetan population, demonstrating an advancement of 0.04 years (mean: 13.01, standard deviation (SD):2.89) in Tibetan young adults [Table 2]. Linear regression analysis was used, in order to produce new maturity scores for dental age in the Tibetan young adults that could be used for the estimation of chronological age [Figure 6]. The following formula was used for calculating chronological age from the dental age in both boys and girls in Tibetan young adults between 8 and 18 years of age. Chronological age = −5.463 + 0.212 (dental age) with R square of 0.704. Plenty of studies in the past decades have focused on original Demirjian method  by rating seven teeth and eight calcification stages by the authors like Hegde and Sood,  Pechnikova et al.,  Farah et al. As the reason of certain demerits, Chaillet and Demirjian modified the original method by including third molar tooth and by adding two extra stages, which became most popular since 2004 for AE in different ethnic groups. Orhan et al.,  Shahrzad et al.,  and Sang-Seob et al.,  reported their study results with less errors when modified Demirjian method (2004) was used. Therefore, the present study was conducted to determine the applicability of Modified Demirjian's (2004) method in Tibetan ethnic group (population). Following the footsteps of Dalai Lama, more than 80,000 Tibetan refugees have fled to India during the past 52 years. First Tibetan settlement started in 1960 with the help of Indian government, to be found at Bylukuppe village in Periyapatna taluk of Karnataka state near Kushalnagar and Virajpet. Almost all Tibetan refugees exile in India were illiterate, off late schools were opened in their settlements to educate their children,  from where we collected the records justifying their chronological age. A general trend of the present findings revealed that the paired Student's t-test carried out to check the inter observer reliability for both the genders within a study sample found no significant differences. Tibetan young adults indicated overestimation of the dental age by about 0.04 years using modified Demirjian's method. Orhan et al., reported, delayed dental maturity in both girls (0.68 years) and boys (1.10 years) in Turkish children of southwestern region of eastern Anatolia. However, according to Sang-Seob et al., dental maturity in Korean juveniles and adolescents were overestimated. Similar results were reported by other authors. , Cultural and ethnic differences in a Tibetan population (young adults) may explain this increased dental age. Other probable causes, which vary among different population groups include growth and development, socioeconomic status, nutrition and dietary habits. In the current study, gender distribution was considered, but not age distribution; because the only purpose of this work was to check the applicability of modified Demirjian's method in Tibetan young adults in the age group of 8-18 years. It was previously stated that, gender differences do exist. With most maturational events, the tempo of maturation is faster in girls. This is in agreement with the findings of our study, that dental age of girls is advanced [0.17 years (2.04months)] than boys [−0.09 years (1.08 months)]. Based on the amount of differences between estimated dental and chronological age in this investigation, Demirjian's method seems to be clinically not applicable, so a new formula was derived for estimation of age in Tibetan young adults. Further studies should focus on collection of more data, especially below 8 and above 18 years of age groups and analysis using other age determination systems. Results suggest that the modified Demirjian method of AE is not suitable for Tibetan young adults. New formula relating to the dental maturity scores (dental age) with chronological age is derived. Further studies with larger sample size and comparsion with different methods of AE in a given population would be an interesting area for further research. We Authors would like to be thankful to the patients for their cooperation and being part of this study. Willems G. A review of the most commonly used dental age estimation techniques. J Forensic Odontostomotol 2000;19:9-17. Willems G, Moulin-Romsee C, Solheim T. Non-destructive dental-age calculation methods in adults: Intra-and inter-observer effects. Forensic Sci Int 2002;126:221-6. Liversidge HM. Crown formation times of human permanent anterior teeth. Arch Oral Biol 2000; 45:713-21. Galiæ I, Vodanoviæ M, Cameriere R, Nakaš E, Galiæ E, Selimoviæ E, et al. Accuracy of Cameriere, Haavikko, and Willems radiographic methods on age estimation on Bosnian- Herzegovian children age groups 6-13. Int J Legal Med 2011;125:315-21. Chaillet N, Demirjian A. 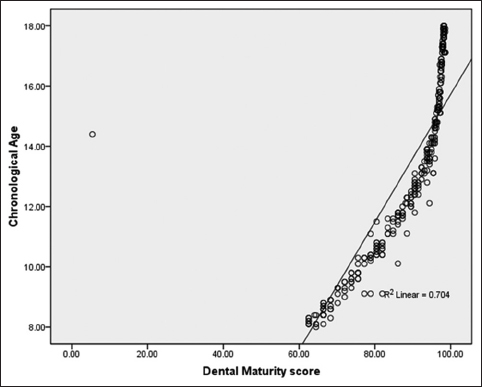 Dental maturity in South France: A comparision between Demirjian's method and polynomial functions. J Forensic Sci 2004;49:1059-66. Leurs IH, Wattel E, Aartman IH, Etty E, Prahl-Anderson B. Dental age in Dutch children. Eur J Orthod 2005; 27:309-14. Demirjian A, Levesque GY. Sexual differences in dental development and prediction of emergence. J Dent Res 1980; 59:1110-22. Dayal PK, Srinivasan SV, Paravathy R. Textbook of Forensic Odontology. 1 st ed, Vol 43. Hyderabad: Paras Medical Publishers; 1998. p. 27-37. Signoli M, et al. New forensic approach to age determination in children based on tooth eruption. Forensic Sci Int 2003;132:49-56. Salariya AS, Gorea RK. Age estimation by Gustafson's method and its modification. J Indo-PacAcad Forensic Odontol 2010;1:12-19. Hegde RJ, Sood PB. Dental maturity as an indicator of chronological age: Radiographic evaluation of dental age in 6 13 years children of Belgum using Demrjian methods. J Indian So Prev Dent 2002;20:132-8. Pechnikova M, Gibelli D, De Angelis D, de Santis F, Cattaneo C. The "blind ageassessment": Applicability of Greulich and Pyle, Demirjian and Mincer aging methods to a population of unknown ethnic origin. Radiol Med 2011;116:1105-14. Farah CS, Booth DR, Knott SC. Dental maturity of children in Perth, Western Australia, and its application in forensic age estimation.JClin Forensic Med1999;6:14-8. Orhan K, Ozer L, Orhan AI, Dogan S, Paksoy CS. 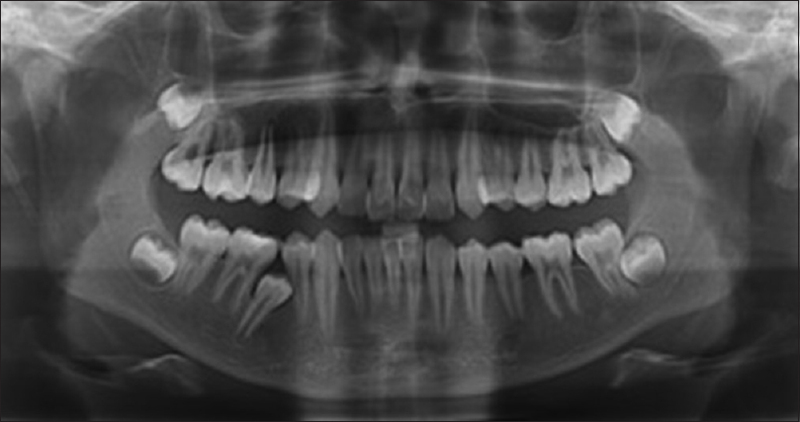 Radiographic evaluation of third molar development in relation to chronological age among turkish children and youth. Forensic Sci Int 2007;165:46-51. Shahrzad JN, Maryam K, Najme H.Association between body mass index and dental development in 7-15 year old children in the city of Isfahan-Iran. J Mash Dent Sch 2010;34:109-16. Lee SS, Kim D, Lee S, Lee UY, Seo JS, Ahn YW, et al. 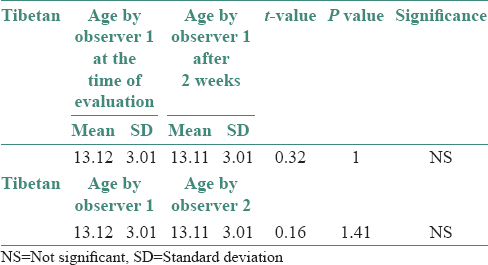 Validity of Demirjian's and modified Demirjian's methods in age estimation for Korean juveniles and adolescents. Forensic Sci Int 2011;2110:41-6. Mc Allan LH. A survey of the gingival health of Indo-Chinese child refugees. Part II. Aust Dent J 1988;33:91-5. Sulaiman EA. Denat age assessment of 8.5to17 year old Saudi children usingDemirjian's method. J Contemp Dent Pract 2008;9:3:1-9. Blankenship JA, Mincer HH, Anderson KM, Woods MA, Burton EL. Third molar development in age estimation of chronologic age in American blacks as compared with whites. J Forensic Sci 2007;52:428-33. Demirjian A, Goldstein H, Tanner JM. A new system of dental age assessment. Hum Biol 1973;45:211-27. Koshy S, Tandon S. Dental age assessment: The applicability of Demirjian's method in south Indian children. Forensic SciInt 1998;94:73-85. Tunc ES, KoyuturkAE. Dental age assessment using Demirjian's method on northern Turkish children. Forensic SciInt 2008;175:23-6. Mitchel JC, Roberts GJ, Donaldson AN, Lucas VS. Dental age assessment (DAA): Reference data for British caucasians at the 16 year threshold. Forensic Sci Int 2009;189:19-23.